An impressive collection of rare and high-grade key vintage baseball cards is set to hit the auction block through Heritage Auctions in September, led by a PSA 8 Ty Cobb 1911 D304 Brunners card estimated at $200,000. The Freedom Collection as a whole is estimated to fetch more than $1.2 million for just 40 cards of Hall of Fame players and will be sold during the Dallas-based company’s Signature Sports Auction that launches on Sept. 10 and ends on Oct. 1. The seller has wished to remain anonymous. 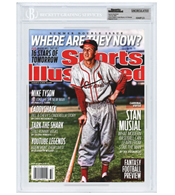 It includes “Shoeless” Joe Jackson, Ty Cobb, Mickey Mantle, Willie Mays among the highlights. See a sampling of the cards after the jump.